A couple of nights before I was heading off to LA for the Thor: Ragnarok press event, I was told some super exciting news! We would be going to Disney’s California Adventure & Disneyland – to have dinner at Cars Land and celebrate the fact that Cars 3 was coming out on digital and blu-ray. I had only been there once before, so I was really excited. We would only have a few short hours to explore, and there was so much I wanted to see. Especially since for the first time ever, Cars Land was all decorated for Haul-o-Ween. The decorations were incredible – and inspiring. They got me thinking about how I could throw a Haul-o-Ween themed viewing party for Cars 3 at home. Joyce from Women and Their Pretties and myself on Luigi’s Honkin’ Haul-O-Ween. There were so many great decorations in Cars Land – they really went all out. But that is not all that they did. They also transformed some of the rides! Mater’s Junkyard Jamboree became Mater’s Graveyard JamBOOree and Luigi’s Rollickin’ Roadsters became Luigi’s Honkin’ Haul-O-Ween! I had so much fun riding these with my friends while there. Probably what I was most excited for was a ride just outside Cars Land – Guardians of the Galaxy: Mission Breakout! While we were there, it changed to Monsters After Dark and was a ton of fun! I can’t stop thinking about this ride – I want to go back on it over and over! Cars 3 hits digital today, which is perfect timing to create a Haul-o-Week themed viewing party for your friends and family! I have a Halloween fun kit for you that you can download. 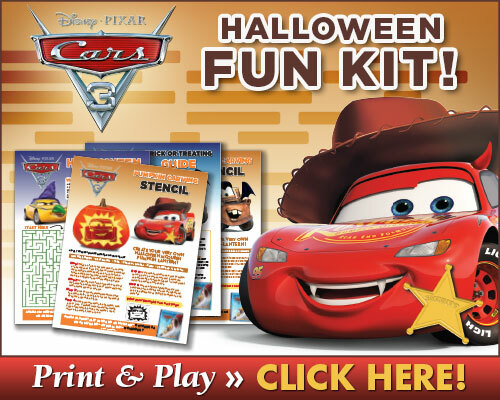 This kit includes a word find, a maze, and some pretty amazing Cars 3 pumpkin stencils. These stencils are really easy to use and kids will love make a Lightning McQueen pumpkin! As far as decor for your party, I suggest picking up some traffic cones. These can be transformed in to spooky faces – and kids (and you!) will have a lot of fun decorating them. Just paint a spooky face and you are done! Don’t forget the Cars 3 toys and games! Kids can take a break from all the Halloween fun and play games like Piston Cup Showdown and Thunder Hollow Mud Madness. You could even put together fun prize packs for the winners of the games that include Halloween candy and Cars 3 toys. Here are a few more photos of the decor at Cars Land. I hope they can help inspire you when getting ready for your Haul-o-Ween viewing party. Or better yet – head over to Disney California Adventure and check it out in person if you can! We were lucky enough to be provided with guides so that we could walk right on rides while we were there. However, there is a new way that can help you get on as many rides as possible there called MaxPass. You can purchase Disney MaxPass in the Disneyland App and connect it to your ticket by scanning the barcode on the back. With MaxPass, you can reserve digital Disney FASTPASS selections right from your mobile device using the Disneyland app while you’re in the parks. And as soon as you use one at an attraction, you can immediately reserve another! Disney MaxPass also includes unlimited Photopass downloads for the day! Disneyland Resort Annual Passholders have the option of purchasing Disney MaxPass for the life of their current passport for $75. Signature Plus passholders will receive Disney MaxPass at no additional cost. CRAZY 8 DRAMA — ©2017 Disney•Pixar. All Rights Reserved. Cars 3 is available on digital today – and of course, that will be a huge party of your viewing party. Gather everyone together and watch Cars 3 either before or after all your fun. In Cars 3, the legendary Lightning McQueen is suddenly pushed out of the sport he loves. To get back in the game, he will need the help of an eager young race technician, Cruz Ramirez, with her own plan to win, plus inspiration from the late Fabulous Hudson Hornet and a few unexpected turns. Proving that #95 isn’t through yet will test the heart of a champion on Piston Cup Racing’s biggest stage! Cars 3 is racing home on Digital Today!